The 2004 recording of Michael Haydn’s Requiem for Archbishop Siegmund, by Robert King and the King’s Consort on Hyperion (CDA67510) was received with a great deal of well-deserved admiration (see review) and garnered quite a few awards. The admiration was not only for some excellent performers but for an impressive work which made clear how justified was the later praise of E.T.A. Hoffmann (quoted in the booklet notes of the present CD): “Everyone with knowledge of music and its literature knows […] that Michael Haydn, as a composer for the church, is one of the finest artists in this field”. If your expectations were whetted by that excellent CD, you will no doubt be keen to hear this new recording of Michael Haydn’s only other setting of the liturgical Mass for the Dead. While I would urge you to hear it, I suspect that you might find the experience a slight disappointment. This is largely to do with the work’s history. This Requiem was commissioned by the Empress Marie Therese – the specific occasion is unknown – and Haydn was at work on it at the time of his death in August 1806. The Requiem and the Kyrie had been completed and existed in a holograph fair copy. The Dies Irae was incomplete. This music, supplemented by material from his earlier Requiem, was performed at the composer’s own Requiem Mass on 13 August 1806. Over thirty years later, in 1839, the little known P. Gunther Kronecker, choirmaster of a Benedictine monastery at Kremsmünster in Austria, completed Haydn’s unfinished Requiem. In doing so he made some attempt to approximate Haydn’s own style; he borrowed (in the Recordare and the Domine Jesu Christe) from Haydn’s first Requiem; his familiarity with Mozart’s Requiem is clear; so too is familiarity with the music of Schubert, with whom Kronecker had studied. Not surprisingly the result is, if not quite a thing of shreds and patches, something of a hotchpotch. The music which is Haydn’s own is less inspired, on the whole, than that in the Requiem for Archbishop Siegmund. There is less sheer intensity, less of the grave elegance of the earlier work. 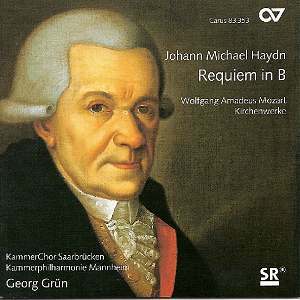 Still, Michael Haydn is a very interesting and accomplished composer and the opening movements of this Requiem are well worth the hearing – even if they are less of a revelation than King’s recording of the earlier Requiem was. I think that King also has the benefit of a superior team of soloists. Grün’s soloists are all thoroughly competent, as are his choir and orchestra, but somehow things never quite catch fire. Much of Kronecker’s continuation has an air of Biedermeier sociability about it, a finally rather constrictive politeness which, while it is pleasant enough, lacks real dramatic or spiritual intensity. The CD is completed by an interesting, and well performed, miscellany of sacred music by Mozart (a confirmed admirer of Michael Haydn’s church music), which ranges, chronologically, from Mozart’s childhood to the months before his death. In London in 1765, aged nine, Mozart wrote (with his father’s assistance) a brief, and decidedly English-sounding, setting of English words from Psalm 46. The manuscript was donated to the British Museum – many of whose mugs, postcards and t-shirts it has graced in recent years. Slight as it is, ‘God is our refuge’ deserves to be heard, especially when sung as attractively and with as appropriate sense of scale as it is here. The Misericordias Domini was first performed in Munich in 1775; it is a striking piece, contrapuntally sophisticated and not without its anticipations of Mozart’s Requiem. Venite populi, exploits the double-choir possibilities of Salzburg Cathedral, where it was first performed. The Ave verum was the last sacred choral work that Mozart completed. Rightly famous, this is an exquisite miniature, a small masterpiece of craftsmanship and expressiveness. Grün and his forces are clearly accomplished Mozartians and there is much to relish in this part of their programme. The main work on this CD, ‘Haydn’s’ Requiem in B, is interesting for historical and scholarly reasons and those reasons certainly justify the exercise of performing and recording it. I am grateful to the performers and to Carus for the opportunity to hear it. I am not sure, however, that on purely aesthetic grounds it is a fully satisfying work – certainly to the degree that Haydn’s earlier Requiem is.